Her Excellency Ruchi Ghanashyam, High Commissoner of India to the UK, accompanied by her husband Ambassador A.R. Ghanashyam, undertook her maiden official visit to the Midlands on 18-19 January, 2019. The High Commissioner Mrs. Ghanashyam is the first woman career Diplomat to be appointed as India’s High Commissioner to the UK. She is also the second woman to be appointed since Mrs. Vijayalakshmi Pandit, who had served as India’s High Commissioner to the UK from 1954-1961. During her visit, the High Commissioner held a series of meetings, and met a number of dignitaries including Parliamentarians, Councillors of Indian origin, leaders of faith organisations and members of the Indian diaspora. High Commissioner visited the Warwick Manufacturing Group (WMG) at Coventry, and met its Founder and Chairman Prof. Lord Kumar Bhattacharyya on January 18, 2019. During the meeting, the High Commissioner appreciated the outstanding contributions of Lord Bhattacharyya to India-UK business partnership, to British industry and in playing an instrumental role in acquisition of JLR by Tatas and unique role that WMG has been playing in bridging the gap between the academia and the industry. She also extended her congratulations to Lord Bhattacharyya on the recent re-naming of the National Automotive Innovation Centre as ‘Lord Bhattacharyya Building’ and the naming of the road leading up to the Building as ‘Lord Bhattacharyya Way’. Mr. David Mullins, Director for External and Internal Relations, WMG was also present during the meeting, which was followed by a tour of the facilities at the Lord Bhattacharyya Building. 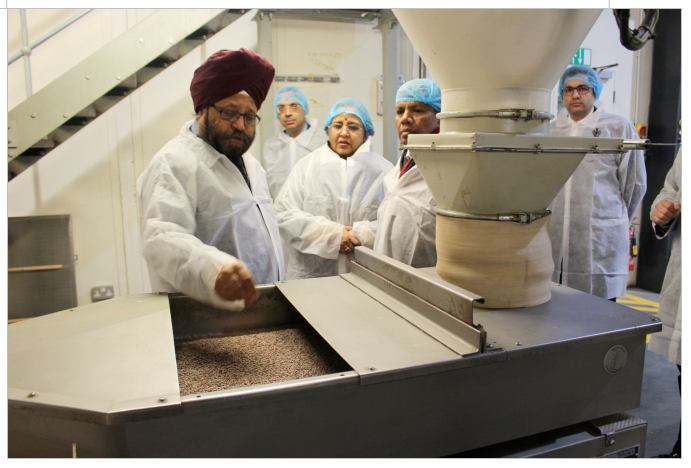 High Commissioner also paid a visit to the East End Foods company in Birmingham on January 18, 2019. East End Foods, led by the Wouhra brothers, is one of the leading suppliers of Indian spices, and other Asian food products in the UK and European market. With more than 300 employees and annual turnover of GBP 200 million, it is one of the most reputed Indian-origin companies in the UK. During the visit, the company’s senior Directors including Jas and Roger Wouhra gave a briefing about the company’s operations and its history. She then hosted aninteraction with British Parliamentarians and Councillors of Indianorigin at the Hyatt Regency, Birmingham. Consul General Dr. Aman Puri introducing the High Commissioner to the assembled guests, expressed the hope that the keen interest taken by the new High Commissioner in strengthening and deepening the political ties between India and the UK would result in stronger bond between the two countries.